Just when it seemed that summer was starting, here I find myself watching the fast approaching end to the season. It has been an eventful one. One major change was the new job that my hubby has. He is once again working for an OTR (over the road) trucking company. It has been a bit of an adjustment for the kids especially, but everyone is doing well with it. We decided to take the summer off after all and will soon be restarting the new term. With the summer’s warm temps, I found it too difficult to keep the kids focused on schooling when the beautiful day was waiting for them to come outdoors to play. So, we have been spending time outside or going on outings. It has been a great decision. We will be starting up our school term after we get back home from our vacation. After vacation, I am going to be getting internet set up at home. So looking forward to that. It has been a long time. It will be a dial-up service but that is so much better than not having any internet at all. I currently only have the internet on my phone, which is why it has been hard to get the blog posts done. Now, it will only be a matter of getting time scheduled to actually work on and post to the blog. One really exciting event that took place over the summer has been Little Man getting a much needed AmTryke. This is a specially designed large tricycle made for special needs children. It has a feature that allows the child to “pedal” the tricycle not only with their feet but with their hands as well. Little Man doesn’t have the leg strength to pedal a tricycle with his legs alone. He also doesn’t have the balance needed for a bicycle. So, in his physical therapy sessions, they have had him ride the AmTryke from time to time. At first, they had to push him using the handle on the back of the AmTryke to help propel him across the gym floor. Now, he is able to propel himself if the surface is flat and smooth. In our yard, we have to push him a bit over the inclines and rough areas, but otherwise he is doing it on his own. AmBucs is the resource we used to get the AmTryke. The physical therapist sent in the order with his measurements and they contacted us via mail. AmBucs has a fundraising site that they use called Crowd Rise. On this site, we were able to list Little Man and share a little about him. It works a lot like the other fund raising websites. You share the link and others donate to the fund. As soon as the money to pay for the AmTryke is raised, they ship it to the physical therapist for assembly and final fitting. This is a great resource for families with special needs children who cannot afford to buy the AmTryke themselves. The cost for it was $735.00. We were able to raise the funds within a few weeks. What a blessing!!! Little Man rides the AmTryke 30-45 minutes a day. It is going to do so much to help him build strength. Though Hypotonia is a neurological disorder that cannot be cured, the effects can be lessened with time and exercise. 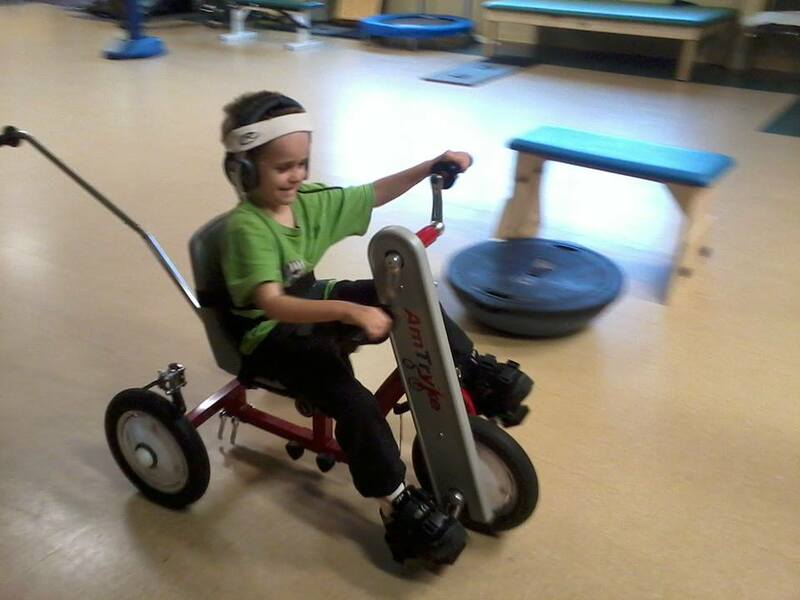 In the past two years since beginning the therapies at the center we take Little Man to, we have seen a huge change in his strength and stamina. He is also making a lot of progress in others areas as well. Little Miss is such a great big sister. She is so compassionate and loving towards her brother. We have been seeking out opportunities for her to shine as well. She is now involved with a church youth group and is signed up for 4-H. She was in the 4-H Cloverbuds program previously. This will be her first year to be in the actual 4-H group. We still need to decide which of the local groups to have her in, but she is enrolled with the organization. She is really excited about it. I am so excited and humbled today. While at the therapy center, I called the wheelchair company for a status on Pookie’s medical stroller. Turns out, the stroller had arrived at their facility and they only needed to set up an appointment with his OT, Miss Amanda, to have the stroller delivered and adjusted to Pookie for a good fitting. Miss Amanda was with us finishing up Pookie’s session, so I handed her the phone. They set up for the stroller to be delivered just 2.5 hrs later when Pookie had his speech therapy appointment. What a blessing! Pookie was excited to sit in his new medical stroller and was very patient as they adjusted the straps. After he was finished and went to his speech therapy session, I was shown how to fold, unfold, and adjust the stroller. Tears were present as I thanked everyone for helping to get this much needed stroller for Pookie. It is going to open doors for him and enrich his life. There are so many places that I have wanted to take him and Little Miss, but was unable to because he wouldn’t have the stamina to spend much time there. The adult size wheelchair we got at a thrift store to use temporarily was not safe enough for him. He could easily climb or fall out. This stroller style will keep him far safer. We will be able to go on more educational and fun outings, including field trips with the homeschool group we are members of. This is truly going to open up more doors for Pookie and the rest of our family. 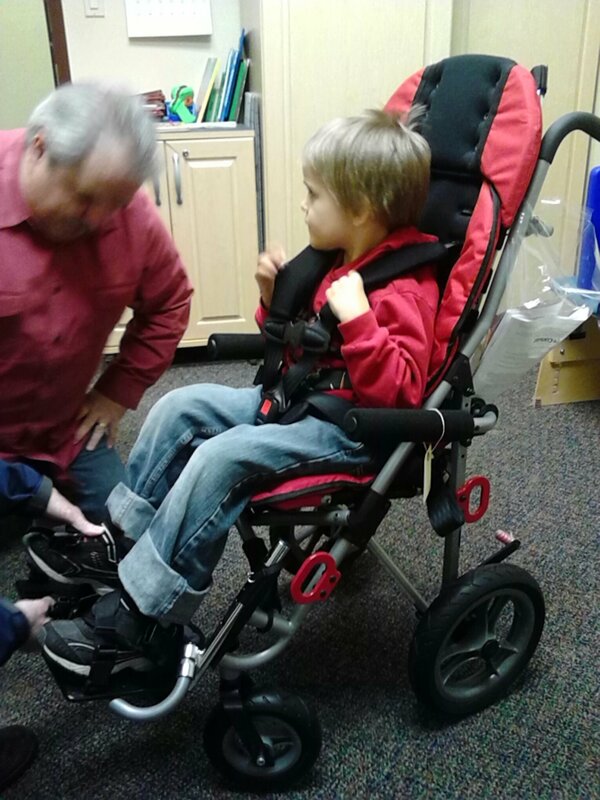 Last November, Pookie’s OT placed an order for him to receive a medical stroller. A rep from the wheelchair company had come out to Pookie’s appt to measure him for the stroller. After the OT submitted a report and the doctor signed it, the claim was submitted to insurance. Two weeks ago, we received a letter saying the claim was denied. After a moment of shock and panic, I made some calls and found out there was a coding error in the claim form. The wheelchair company resubmitted the claim with the correct coding and we sat back for another wait. We finally got notice that the insurance approved the claim and the stroller has been ordered. It should arrive to the wheelchair company within 10-14 days from the order date. The rep will bring the stroller to Pookie’s OT appt to make sure everything is fitted properly for him. I am SO excited for Pookie to get this stroller. This will allow us to take him on more outings, such as the upcoming field trip to the heritage museum that the homeschool group has planned for next month. Pookie’s legs give out due to low endurance. He has generalized Hypotonia, which is low muscle tone. It is a neurological condition he was born with. That is why the medical stroller is so important for him.